You won't see designer Christmas trees at my house - they're beautiful but they're not what I want. When I was younger I thought I'd grow up and have a family tree and a 'mom tree' in the front room, but now I can't imagine having anything other than the glorious hodge podge of one family tree, decorated with love. Magazine-ready trees with classic shapes, perfectly arranged ribbon garlands and color coordinated, themed ornaments... while gorgeous to look at, they're just not for me. Family trees are perfect for me because of their imperfections. At the lot I head straight for the wacky ones while everyone else gathers around more popular types like Noble and Grand Firs; this year we have a Lodgepole Pine, complete with piney packages and little cones! We come home and string it up with all sorts of randomness: chili lights, beads, pom poms, handmade ornaments and store bought ornaments alike. We are an equal opportunity tree decorating establishment here, and I wouldn't have it any other way. 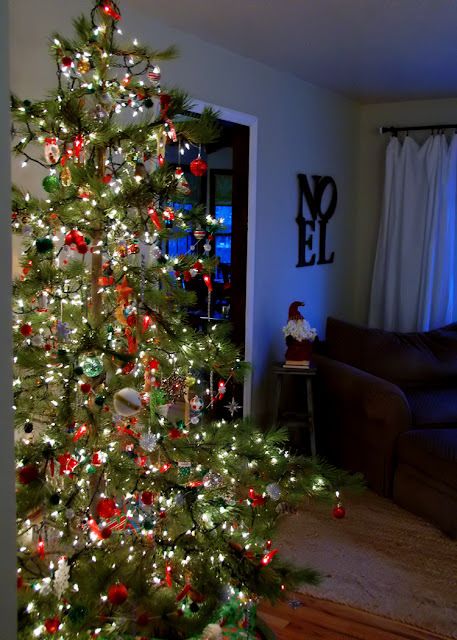 I think it's gorgeous, even with the odd ornament or garland dragging on the floor thanks to dogs with tornado tails. What about you? 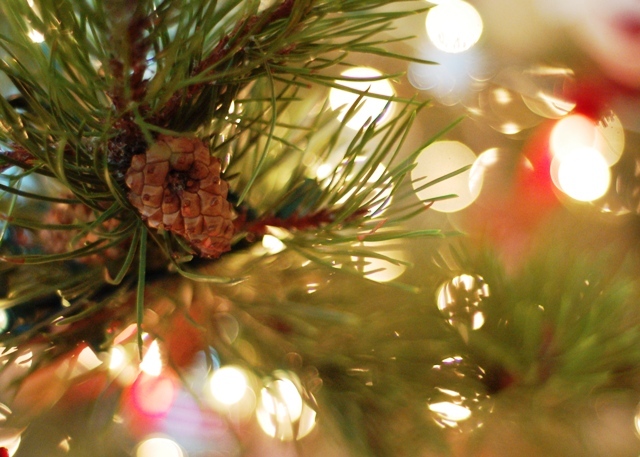 Do you plan your tree's decorations carefully or is it the entire family's domain? I love your hodge podge I wish my kids were still young enough to want to decorate the tree with me. Very nicely done! For the last three Christmases (since my Norfolk Island Pine died -- I put it outside too early), I've used my two largest jade trees for Christmas trees, which I bring inside every autumn. They're beautiful. Just one small string of pretty flower-like lights and a whole bunch of neat old and new ornaments, some homemade. All carefully chosen or meaningful. I do have to be careful not to hang heavy ornaments on the ends, or it'll droop, but it's lovely every year! I love this post on so many levels, sweetie. 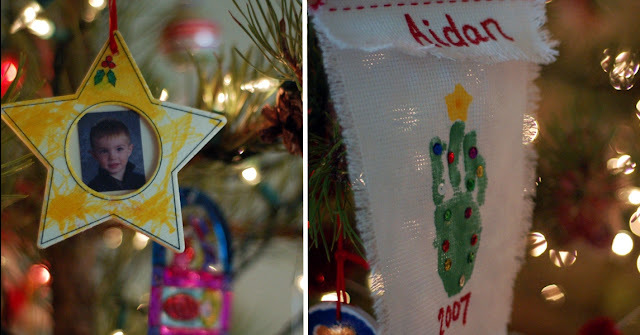 As you know I grew up with a family tree, which is why YOU did too, and my favorite moment of the holiday season was unpacking those treasured old family ornaments. Some were valuable blown glass from Europe, but after a couple of childhood tree crashes, most of what's left is sentimental. A Christmas card from 1951 still decorates my tree every year. Hodge podge or not, it looks lovely. This is what the holidays are about. Charlie Brown Christmas trees are my favorite! We have a hodge podge tree, too. In fact, this year, most of our ornaments are made of salt dough, and are hung on only one side of the bottom third of the tree -- exactly where my little boys put them! We tried to add some candy canes, but they didn't last a day. Maybe next year. Hi..I found your site while doing some googling for Christmas ideas. I used to do a 'family style' tree...many years in fact. And we tried real trees but I found out I've got some allergy or something :-( But when our two boys got busy and hubby was busiest at that time of year too,I found myself having to take off the seemingly hundreds of tiny little ornaments all by myself. 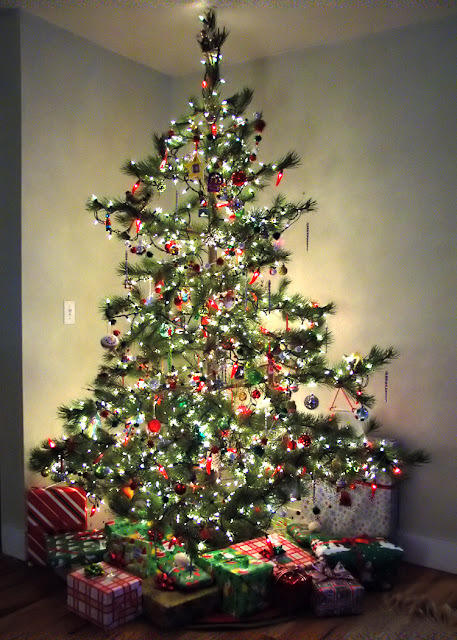 Finally I packed them all away and went with a designer-styled tree. I suspect I'll eventually give each boy's ornaments to them for their own families to enjoy.